The Miami Valley Orchid Society is dedicated to the largest flowering plant family on the face of the earth– the orchid. The Miami Valley Orchid Society exists to help its members grow, show and enjoy orchids. Please join us at the Cox Arboretum for our monthly meetings that are typically held at 7PM the 2nd Wednesday of each month (See calendar tab to confirm meeting date) and our spring show held every February. We also informally gather before each meeting at 6:30 to help those with specific cultural questions about their plants or growing area. Membership is $20 per year for individuals and $25 per year for families. The Miami Valley Orchid Society was formed in 1954 with its first set of bylaws established in 1955, which contained rules requiring a vote of the membership in order to join the society- which is, thankfully, no longer the case. The first meetings were held in Walton Riffe’s Greenhouse on Ridge Avenue until 1961 when they were moved to the Dayton Museum of Natural History. In 1963 meetings were held at the Patterson Homestead and were held there until moving to Cox Arboretum in 1981. Public orchid exhibits began in 1959 and were held at various locations including 3rd National Bank, Siebenthaler’s South Garden Center, Winters Bank Tower, Wegerzyn Gardens MetroPark and Cox Arboretum MetroPark. 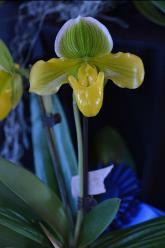 The first American Orchid Society judged show was held in 1971 at Siebenthaler’s and have continued since. Shows have also been held at the Dayton, Salem and Towne Malls in addition to those locations listed above.